Organisms across all biological kingdoms possess the common challenge of sensing and adapting to a changing and often hostile environment. Complex arrays of molecules, molecular complexes, and genetic and metabolic networks have evolved to perceive environmental challenges and trigger the appropriate adaptive response. Such responses often represent a life or death “decision” that determines organism survival. With the vast genomic and bioinformatic resources now available, scientists are beginning to understand and predict how molecular and cellular networks coordinate behaviors of cells and organisms. This is the emerging area of “systems-level biology” which is at the forefront of modern cellular and molecular biology and it is poised to transform medicine and agriculture. 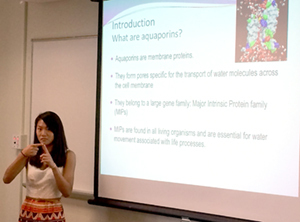 This summer REU program will provide students with the opportunity to engage in multi-disciplinary research projects employing molecular, genetic, genomic, and systems level approaches to investigate the strategies through which model organisms across the biological kingdom sense and adapt to a changing environment. Highly motivated Deaf and hard-of-hearing undergraduate students with a major in Biology, Chemistry, or other major in the Physical Sciences or Engineering who are interested in molecular and cellular biological research and a career in STEM. Highly motivated hearing undergraduate students with a major in the Biological or Physical Sciences/Engineering, and/or Deaf Studies/Education who are interested in developing and refining skills in American Sign Language (ASL) as well as biological research, and a career in STEM. No prior research experience is required, however, priority will be given to students who have completed at least one course in biology and/or chemistry. For Hearing students, prior experience with ASL is recommended. Undergraduates who will be attending a college or university in fall 2019 to work toward the Bachelor’s degree. United States citizens or permanent residents (required by NSF guidelines). Underrepresented groups, or those who are the first generation in their families to attend college are encouraged to apply. Apply online now before April 1.